Recently EA have spoken in secret about the Nintendo NX and their lack of plans to develop for it. They outlined a bunch of things that Nintendo is required to do in order to be blessed with EA’s fantastic library of quality games. To sum it up, they want Nintendo to “provide a market for sports games” by throwing millions of dollars on sports advertising. They just want a userbase that will buy sports games. Sound fair? ARROOOOOO!! This game has jumped into the spotlight with the recently announced Twilight Princess HD for Wii U so I thought it was a good time for a writeup. I started replaying this on a whim a few weeks ago and have become completely absorbed in its world. Being such a gigantic game, I haven’t done a playthrough since the Wii launch, but I was delighted to discover the game is much better than how I remember it. It’s huge and sometimes slow, but never boring. It’s such a wonderful game. Rather than being an intimidating “time sink” game, it’s been a special part of my day as I’ve slowly rediscovered this enchanting world at my own pace. The land is populated with beautiful, innocent life, but is also threatened by a dark curse. This contrast creates a sense of mystery and urgency that makes even basic travel interesting, and had my mindset permanently engaged and interested all the way to the end of the game. This writeup isn’t a traditional review, I’m going to talk a LOT about the story so it’ll be filled with spoilers, so just don’t read if you haven’t played the game. Or maybe you’re just a free spirit who doesn’t mind spoilers so go for it. I think life is too short to experience everything perfectly. Sometimes you just have to let loose and read a blog post. 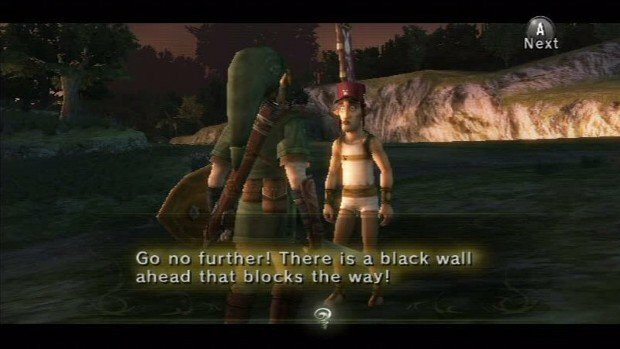 Like Pietriots, Twilight Princess is rich in surprises and variety and I had so much fun rediscovering all the themes and gameplay elements. Xenoblade Chronicles has been out for a few years now (depending on your region) and I still listen to the soundtrack almost daily. With almost one hundred well-composed songs brimming with heart and energy, it’s incomparable to anything else in music let alone videogames. Many RPG’s have large impressive soundtracks and it’s a huge strength of the genre, but Xenoblade pushes creativity to new heights with the variety and consistent quality throughout. There’s enough here to find something different to listen to every day and for every mood. I think music in videogames is very important, and while not every development team can form a super band of composers like Xenoblade, they should at least try. There’s no reason to let the powerful magic of music go to waste and I’m going to outline some things Xenoblade does right and why it’s the absolute pinnacle of videogame soundtracks. It’s a good thing the big April Wuu update isn’t out yet, giving me a chance to complain about stuff while it’s valid. Let’s briefly revisit some of Wuu’s non-features, or why I didn’t fall for that “trap”: never performed that permanent “system transfer” of my Wii data as soon as I got my Wuu. As with any dangerous entertainment content migration of this sort, I had to find out: does Wuu’s “Wii Mode” retain all the features the Wii did?